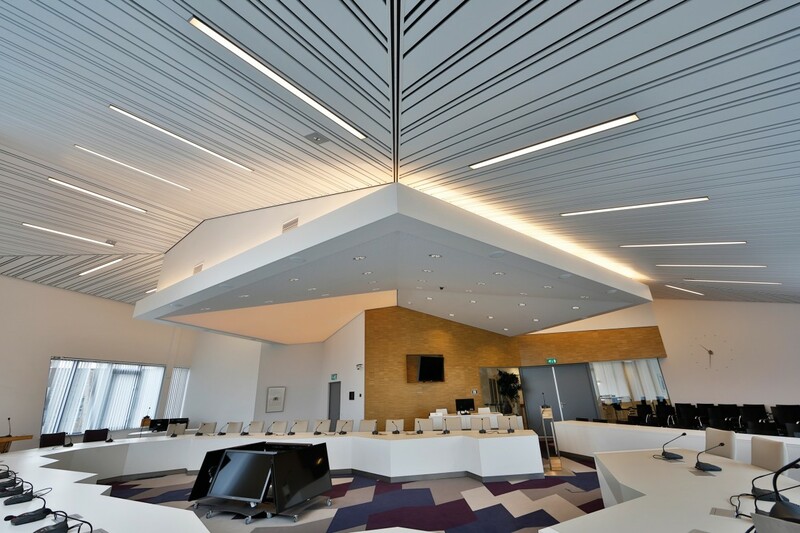 Hunter Douglas Architectural were one of the pioneers of suspended metal ceilings and as such are a recognised authority in the research and development of Interior metal ceilings. The result is a comprehensive portfolio of aluminium, steel and stretch metal systems. The range incorporates, linear, baffle, wide panel, open cell, curved and tile options. Both standard and bespoke carrier systems are available giving the designer greater flexibility and allows for a more creative approach to filling the ceiling void.Panels and tiles can be laid, clipped or hooked on to the carrier system with a swing down version available where ease of access to the plenum is important. As with many large open internal spaces acoustic performance is paramount in maintaining good sound absorption. Commercial office space, schools, gymnasiums, swimming pools, shopping mall and transport hubs all need to create a comfortable environment for their staff, pupils, visitors and travelling public. This is where Hunter Douglas Architectural excels helping architects and designers realise their design ambitions whilst delivering a ceiling system that delivers on performance and is ultimately fit for purpose. Find out more about Hunter Douglas Ceilings on their website. Ceiling looks good and sounds great !! !